"Had a great time. My visit to Zurich happily coincided with their annual Beer and Sausage festival. Indulged in some Olympic level drinking and ate an awful lot of sausage and cheese. During a particularly heavy cheese session on Saturday night/Sunday morning, I seem to remember commenting that I was bound to have some rather interesting dreams after consuming such a large and varied quantity of strong cheese. This remark was greeted with blank looks from my Swiss hosts. Thinking that my English had somehow failed me, I attempted to explain myself in simpler terms and using gestures to portray the intense dreams I was expecting to be induced by their fine cheese. Again, nothing but blank looks. Spurred on and gaining inspiration from the strong Swiss beer I had been drinking, I was convinced that my point was a valid one. I seem to have become a little obsessed with explaining this now very important dream issue and I remember becoming ever more animated in my portrayal of the wild dreams I was expecting. I think I was at the stage of impersonating Kate Bush dancing to Wuthering Heights combined with a bit of Hunter S Thompson thrown in for good measure - the looks of the Swiss people now turning from blank to blind horror - when it occurred to me that maybe the Swiss don't associate strange dreams with eating cheese just before bedtime. Maybe, having consumed large quantities of cheese all their life, they had built up some kind of strange cheese tolerance. Stranger even still, they had become used to their cheese induced dreams and took it for granted that every night they would be visited by the Incubi and Succubi of the cheese world. 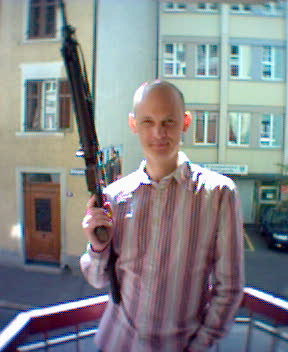 Those crazy Swiss. They are certainly a very tolerant bunch and for an independent nation have a real love of guns - all men are forced to do National Service and are actually given some form of weapon to keep at home. 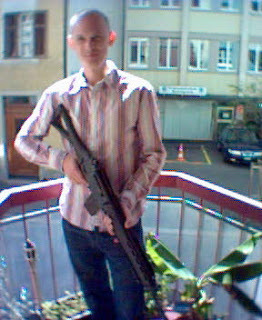 I am pictured with the Swiss Army Assault rifle - on a balcony in a very posh area of Zurich. There was not enough light in the apartment I was visiting to accommodate my phone camera so obviously I was ushered out onto the balcony. I asked if it was normal for a smiling shaven headed man to be seen posing with an assault rifle on a balcony in Zurich on a Sunday morning? My hosts laughed and said it would be tolerated. Those crazy Swiss."